Complex metabolic diseases such as heart failure and diabetes show impaired glucose and fatty acid oxidation and diminished energetic states in various tissue/organ systems, probably due to alterations in the signaling, biochemical, and structural components of metabolic pathways. 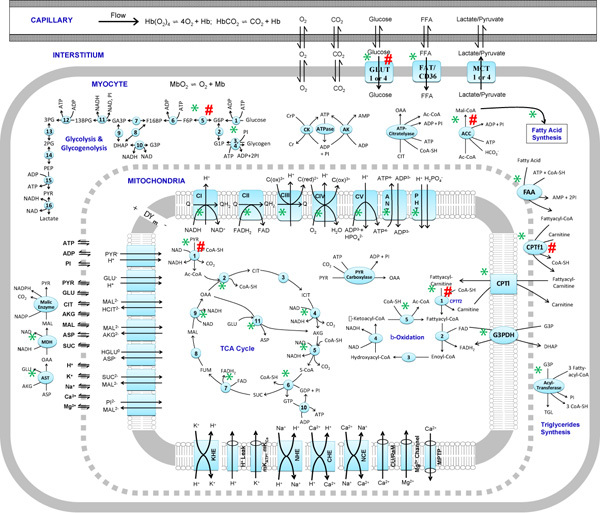 The overall goal of this scientific project is to develop a systems biology platform to mechanistically understand the mechanisms of interactions among the transport and metabolic processes comprising energy metabolism at various biological scales (transporters/enzymes, mitochondria, cells, tissues/organs, and whole-organism) in healthy and complex metabolic disease states. Towards achieving this goal, we are developing multi-scale computational models of solute transport and energy metabolism in various tissue/organ systems and in the whole-body in conjunction with experimental measurements in specific rat strains representing the healthy and diseases states. 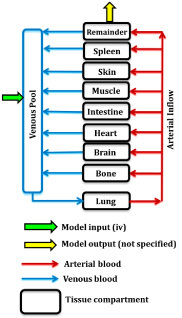 Once an integrated model of whole-body solute transport and energy metabolism in the rat is developed and validated, it may be applied to predict and analyze in-silico the time profiles of metabolic changes (e.g., changes in oxygen and substrate utilization) in various tissue/organ systems and in the whole-body to a variety of acute perturbations under normal and pathological conditions, including diabetes and heart disease.